In 1986 my accountant from Ohio visited Florida with his young son on the day NASA’s Challenger was to blast off. As I left to meet him at a McDonald’s north of Sarasota I put binoculars on the passenger side front seat of my car just in case I caught a glimpse of the lift-off from the other side of the state. As luck would have it, as I began to exit the restaurant’s parking lot I saw the huge rocket lifting skyward. I stopped and trained my binoculars on it. As I watched, the rocket disappeared into a white cloud bank and I waited for it to reappear above the clouds. It never did. I saw large trails of white smoke. Could it be, I thought, that the launch had malfunctioned? I turned on my car radio and, as I drove southward along the Tamiami Trail I heard the bad news. For years, I believed every word of the government’s narrative, the O-Rings, the bodies, and, as later following TV’s 9/11, Sandy Hook, and the Boston bombing, the horror of it all. As a start in understanding the Challenger disaster hoax it is imperative to grasp the fact that all publicized Apollo missions to the moon and back in the late 1960’s until the end of December 1972 (Apollo 17) were a hugely expensive hoax. It has taken until the growth of the internet and widespread publication of purported original moon imagery, said to be photographed miles apart but containing the same exact backdrop, to put the nail into the coffin of that monstrous hoax. Anyone who still doubts this fact can begin their own research. NASA ought really to stand for Nonsensical American Space Allegations. 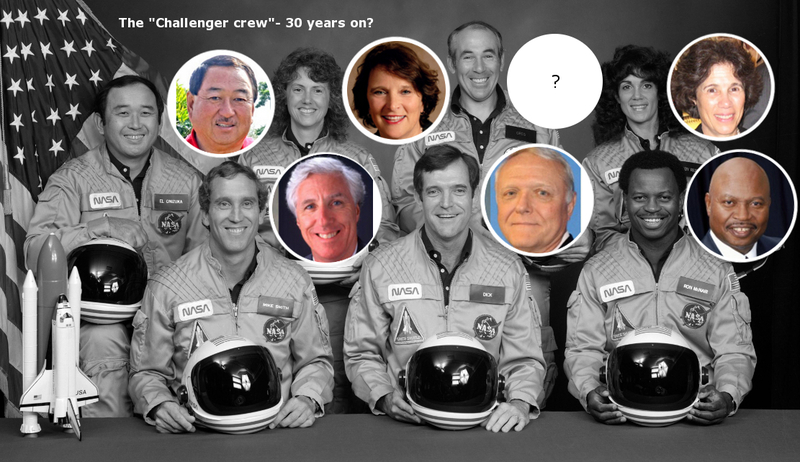 Filed under: CHALLENGER CREW MEMBERS, SPACE PROGRAM HOAX |	Comments Off on ARE CHALLENGER’S CREW MEMBERS ALIVE?